What Kind Of Home Would a Building Pro Build for Himself? 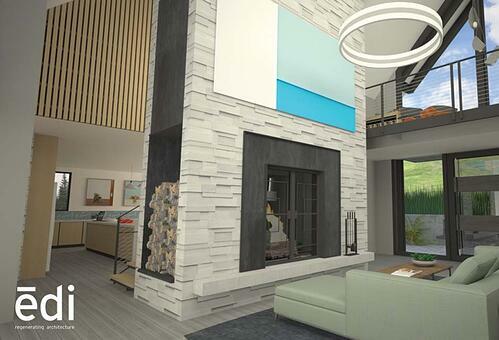 Green Builder Media’s next project in its VISION House demonstration series is a collaboration with CR Herro, VP Innovation at Meritage Homes, to design and build a home template that can be replicated across the country. Green Builder Media has always endeavored to swing for the fences, with the goal of setting the standard for excellence in sustainability, quality, durability, intelligence, and wellness in the built environment. Everything we do advances our mission to improve the performance of homes in North America. So, when the chance came along to work with CR Herro, VP Innovation at Meritage Homes (8th largest homebuilder in the nation), to design and build his personal residence on a spectacular 20-acre parcel approximately 30 miles southeast of Seattle at the base of Mount Rainier National Park, we pounced on the opportunity. The minute that Herro, a brilliant building scientist and meticulous green builder, shared his desire to create a home that united sustainable design techniques with advanced products, systems, and technologies for optimized performance and wellness at a reasonable price point, we knew this was a project for us. So, we gathered together some of the brightest minds in the country, including internationally esteemed, award-winning architect Stace McGee, Founder of Environmental Dynamics Inc. as well as a band of leading engineers, contractors, and building manufacturers, to create the VISION House Seattle Cascades: The House the Experts Built. The goal of the project is twofold. First, we want to highlight and exemplify the gamut of issues that building professionals and consumers should consider when building green homes in today’s market, including novel design approaches, advanced products, enabling technologies, efficient building systems, and renewable energy. We will document the entire design and build process, and we’ll also perform a 2-year data collection and performance analysis study, so that we can create case studies as well as a template that we can share with building professionals and consumers throughout the country. We realize that the solutions that we deploy in this particular home can’t be appropriate for every climate zone, aesthetic, or code jurisdiction, but our objective is, at a minimum, to present ideas, concepts, and questions that should be considered for any project across the nation to optimize function for its inhabitants. Related Story: Video Walkthrough of Smart, Small-Footprint Net Zero Prefab Living. Our second goal is to debunk the price per square foot and lowest upfront cost valuation metrics to achieve fully independent resource regulation that have been stifling our industry for too long. These metrics are no longer valid, and they are wholly insufficient for measuring cumulative quality, performance, resilience, intelligence, wellness, and environmental impact. By working with the VISION House Seattle Cascades partners and sponsors, we plan to demonstrate the benefits of long-term thinking (for example, we’ll validate how investing in efficiency, resiliency, renewables, smart home technology and indoor air quality saves money), highlight lifecycle value, and showcase how we can fully monetize sustainability. We look forward to working with a cadre of subject matter experts and product manufacturers like Uponor, Whirlpool, Western Windows, Panasonic, Boral Roofing, Schneider Electric, Schott, Premiere SIPs, and Nudura to explore the horizons of what it means to build green in today’s market. The project will be completed in early 2020–follow along as Herro builds his house via video updates.